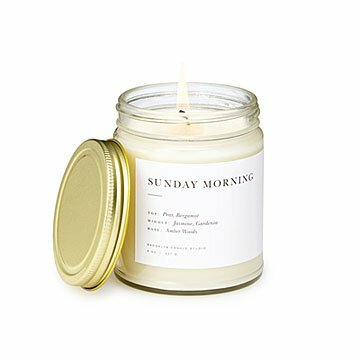 Capture that lazy Sunday feeling with Tamara Mayne's calming soy candle. Reminiscent of lazy Sunday mornings sifting through luscious fruits and freshly picked flowers at your local farmer's market, this candle lets you relive that feeling with the strike of a match. The candle's minimalist design makes it a welcome addition to your mantle, nightstand, or airy entryway. Tamara Mayne fills the brushed gold tins with soy wax derived from American-grown beans for a clean, eco-friendly burn. She also primes a natural cotton wick with vegetable-based wax and premium-grade fragrance oils in three blends. Top notes of pear and bergamot drift above a core of jasmine and gardenia, with a grounding base of amber woods. Handmade in Brooklyn, New York. A former art director, Tamara Mayne brings a design eye to her small-batch, deliciously scented candles. Reflecting the minimalist look and feel of her handcrafted pieces, she keeps production simple: natural waxes, cotton wicks, botanical perfume oils, poured in batches of 10. Known for their fresh, calming botanical fragrances and minimalist packaging, her elegant candles can be found in homes all over the world. "Simple and minimal, our candles are designed to complement every style of home," she says, "from modern to bohemian." Trim wick to 1/4 inch before lighting. Keep candle free of any foreign materials including matches and wick trimmings. Only burn the candle on a level, fire resistant surface. Do not burn the candle for more than 4 hours at a time. Discontinue use when 1/2” of wax remains on bottom. Never leave a burning candle unattended. Keep wick trimmed to avoid big flame, don't burn longer than 4 hours at a time to avoid overheating. Keep away from drafts, pets and children. Burns up to 50 hours. It was a little smaller than anticipated for the price, but very beautiful to look at, and perfect scent! It's like a relaxing day, surrounded by a floral shawl,. Almost a travel product - transportable. You can take your mood with you!